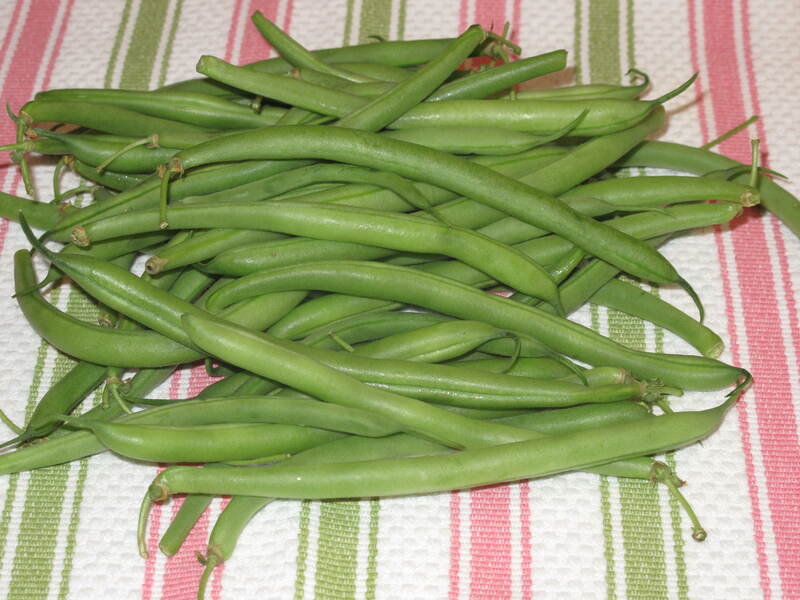 This is our first harvest of green beans from the garden. What should we do with them was the question? I had an answer for that, based on a recent recipe I saw on a cooking channel. 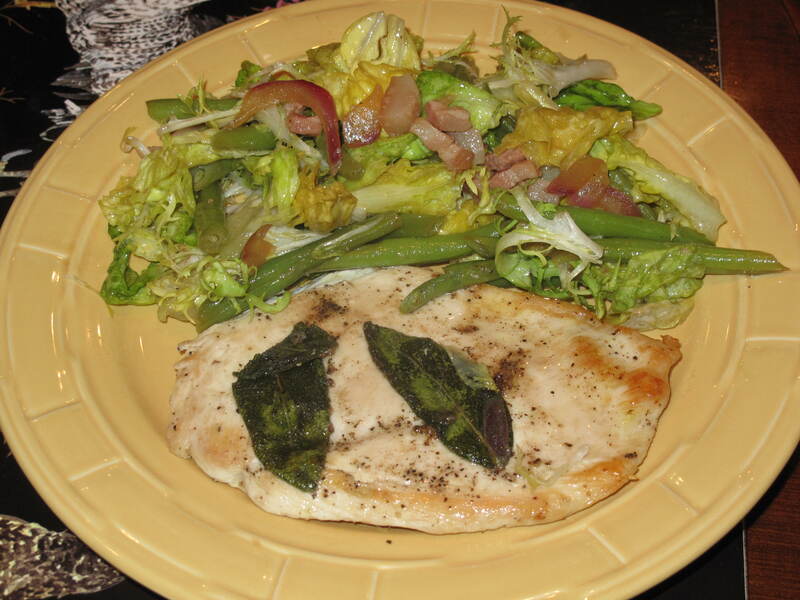 Fresh green beans are perfect for a chicken paillard with fresh greens and beans. We had been on such a food overload since our early July 4th party where we ate an incredible amount of food over the span of the event. This recipe was perfect for us in the sense it wasn’t heavy, wasn’t grilled and was quick and easy. It also called for very fresh ingredients, which is always a plus. Even on the 4th of July, I was able to get to a fresh farmer’s market that was open for some of the other ingredients needed that I couldn’t get out of our garden. If you are lucky enough to find a place that sells fresh, organic produce, it is well worth the price. The fresh tastes can’t be beat. This is the perfect Summer go-to recipe and hit the spot for our 4th of July dinner. 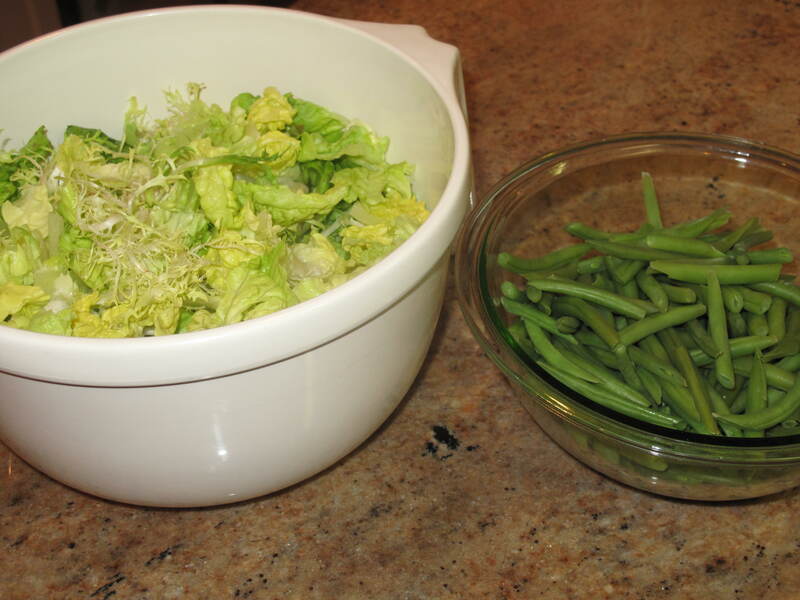 Steam string beans until al dente, 3 to 4 minutes. Dump them into a bowl and set aside. 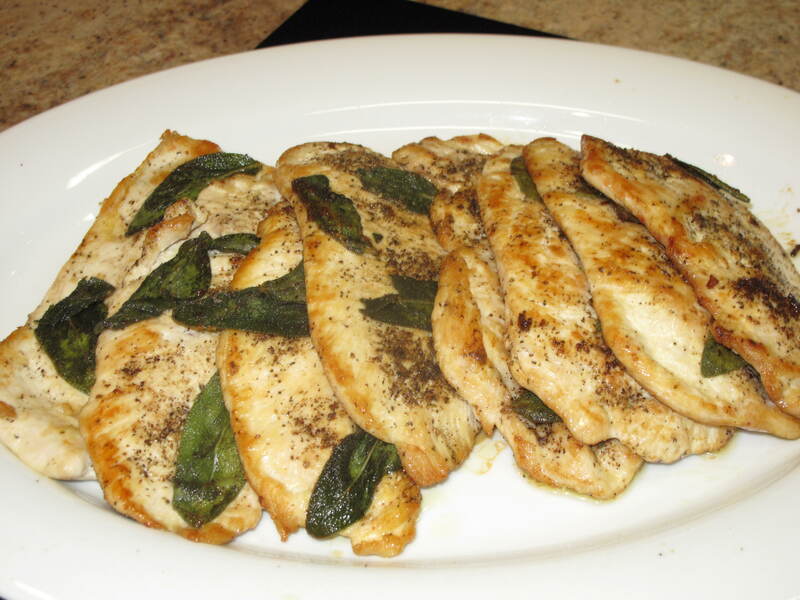 Slice chicken breast halves in half horizontally; pound lightly, to an even thickness to make 8 paillards. Season paillards with salt and pepper. Top each with 2 sage leaves. 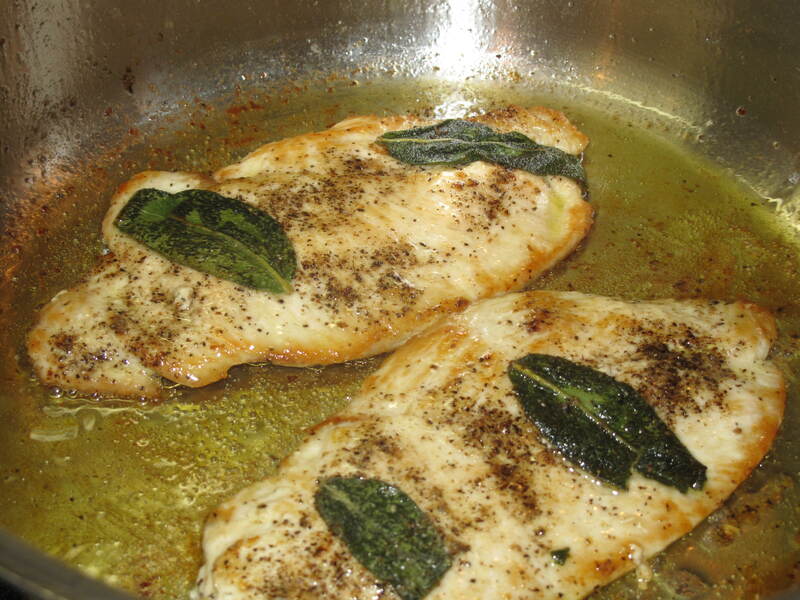 Saute in a skillet with olive oil over high heat for 3 minutes. Flip, and top each with more salt, pepper and 2 more sage leaves. Heat until cooked through, about 3 minutes more. When all 8 paillards are cooked, heat 1 tablespoon oil in skillet over high heat. 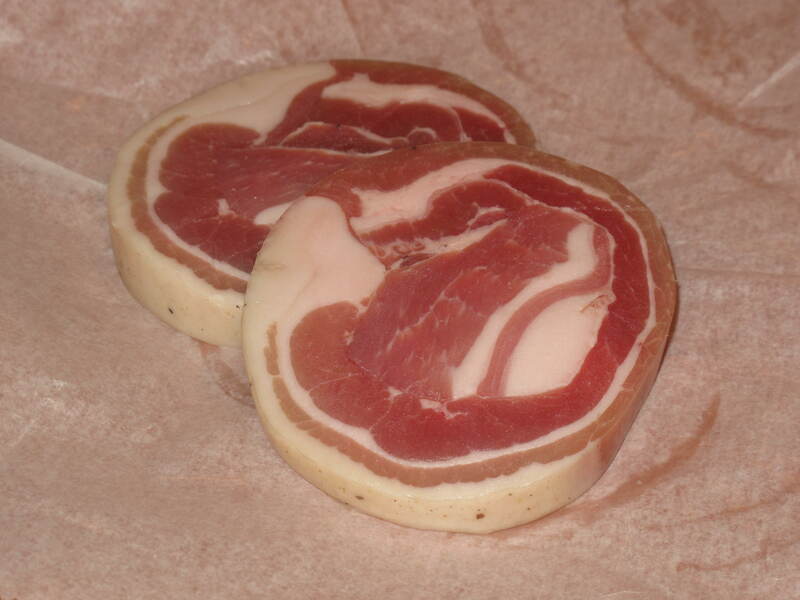 Cook pancetta for 2 minutes. Add red onion; cook until soft, about 3 minutes minimum. Make sure to scrape up all of the chicken bits that are attached to the bottom of the pan. They have excellent flavor. 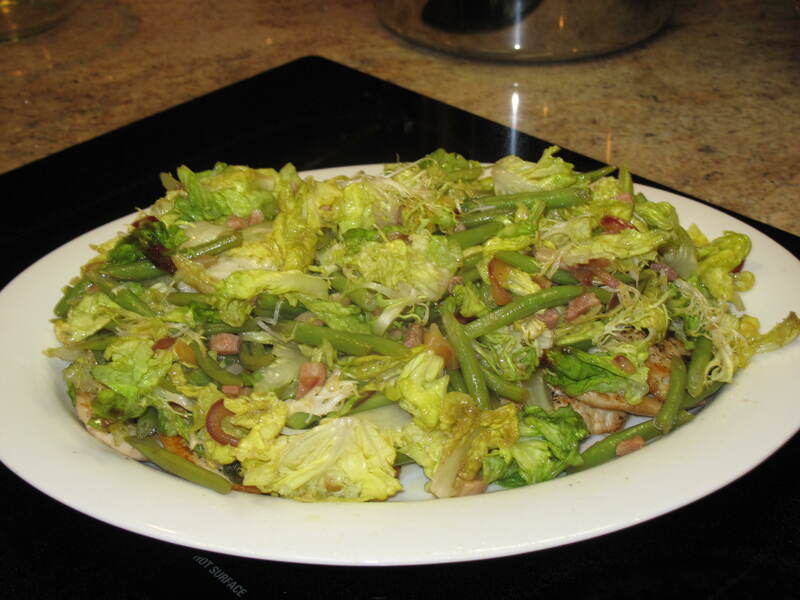 Add red-wine vinegar; stir in green beans. Simmer for about two minutes to let the vinegar cook down a little and to heat up the green beans. Toss with lettuce. Serve over paillards. There is a lot of greens and beans as you can see. You can barely see the chicken under all of this salad. Simple and quick. We were not in the mood for crazy and difficult. Very tasty and hit the spot. The warm dressing on the slightly wilted lettuces was a nice touch. 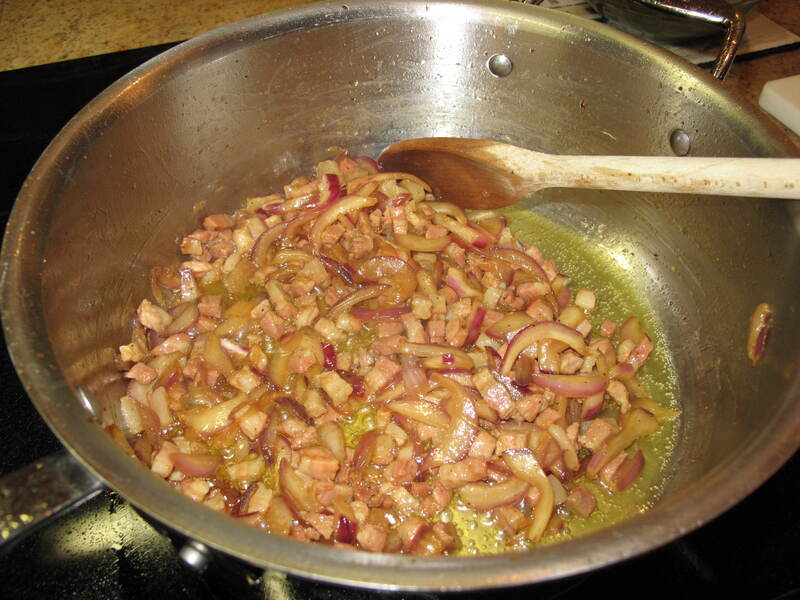 The pancetta, onion and vinegar had a nice mix of flavor. Believe it or not, the chicken also kept its sage taste which surprised me given that I thought the flavor would be in the olive oil and not the chicken. This is absolutely a new go-to Summer meal when we need something in a jiffy. When it’s 100 degrees outside, who wants to spend all day cooking in front of a hot stove and oven? Not us, that’s for sure. What is your favorite go-to me meal for the Summer? This entry was posted in Food and tagged Acorns, Beauty, Blog, Cooking, Family, Food, Fun, Gardening, Holiday, Life, Lifestyle, Love, Main Dish, My Life, Photos, Recipes, Summer. Bookmark the permalink. What a great recipe. My sage is doing pretty well too! Favorite go-to meal of the summer, anything grilled. Hi. Hope all is well. I love the grill too….just need to give it a rest for a few days after our party. I can’t believe I’m writing that I have had enough hamburgers/hot dogs for the time being. Come back and visit soon.